Liberty Bank was Washington State’s first primarily black-owned bank. It opened on May 31, 1968 in Seattle’s Central District (CD) at 24Th Avenue and East Union Street. Liberty Bank grew out of the desperate need for a black-owned bank that would lend to African American homeowners and to white and black business owners in the CD. Mainstream banks adhered to redliningpractices, refusing to provide mortgages or business loans in communities of color. Eight prominent black leaders including Rev. Samuel Kinney, Dr. James Jackson, James and Mardine Purnell, and Holbrook Garrett worked with George Tokuda and Jack Richlen, Japanese and Jewish business owners in the CD, to pool their resources and apply for a State Charter to open Liberty Bank. Washington Gov. Dan Evans led the ribbon-cutting ceremony. The bank was a community-based bank with 518 stockholders; 80% were blacks of modest means. Liberty Bank fulfilled the Prince Hall Grand Lodge’s (a Masonic Order for blacks) dream of going beyond the black-owned Sentinel Credit Union in the CD that could not give mortgages or loans. Unfortunately the State closed the bank in 1988 due to its deficits and uneven profits in the mid 1980s. The bank was reopened as the Emerald City Bank, and later acquired by Key Bank. Key Bank closed the bank and sold the property in 2015 to Capital Hill Housing (CHH) which pledged to continue the legacy of Liberty Bank by developing the Liberty Bank Building to provide affordable housing to 115 families. Black community leaders initially were concerned about the demolition of the Liberty Bank building and the Liberty Bank Building project as continuing the displacement and disenfranchisement of the African American community. To address these concerns CHH partnered with African Town Central District, Byrd Barr Place, and Black Community Impact Alliance; these are black community organizations in the CD. They established a Memorandum of Agreement focused on strengthening black businesses, increasing local and minority construction hiring, reducing housing displacement of blacks in the CD, designing a building that connects with the bank’s CD’s history, and diversifying CHH’s Board and staff. This unique memorandum gives Byrd Barr Place the right of first offer and first right of refusal to acquire Liberty Bank Building after 15 years so a black community-based organization can own the building. CHH also supports black businesses by agreeing to establish a business innovation fund to promote more small, black-owned businesses in the CD, and working with the partners to make the commercial space of the Liberty Bank project affordable. To help reduce displacement of blacks from the CD, the community partners are affirmatively marketing available rental units to black community members who have displaced by gentrification and redlining housing practices. CHH has also convened a community advisory board to ensure that the building design honors its history as Liberty Bank. The building will reuse the yellow bricks in its façade, have a plaque with the history of the bank, display photos of the bank, and provide other design features that honor the bank and community. The new building is scheduled to open in 2018. Colin Ditz, “A brief history of Washington State's first black-owned bank located in the Central District Seattle Times From the Archives, https://www.seattletimes.com/seattle-news/liberty-bank-seattles-first-black-owned-bank-opens-in-the-central-district-in-1968/; People of the Central Area and their Stories: Michelle Purnell-Heburn, http://centralareacomm.blogspot.com/2013/07/michelle-purnell-hepburn-vp-controller.html; Capital Hill Housing, Liberty Bank, http://libertybankbuilding.org/the-project-partners/. 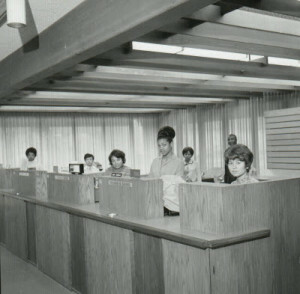 Colin Ditz, “A brief history of Washington State’s first black-owned bank located in the Central District Seattle Times From the Archives, https://www.seattletimes.com/seattle-news/liberty-bank-seattles-first-black-owned-bank-opens-in-the-central-district-in-1968/; People of the Central Area and their Stories: Michelle Purnell-Heburn, http://centralareacomm.blogspot.com/2013/07/michelle-purnell-hepburn-vp-controller.html; Capital Hill Housing, Liberty Bank, http://libertybankbuilding.org/the-project-partners/.